Luxury single malt, The Macallan, has partnered with sport and lifestyle brand Oakley, Inc. to produce a unique limited edition flask. Entitled ‘The Flask’, this latest collaboration for the brand has an edgy, adventurous feel. It underlines both The Macallan’s credentials in innovation whilst adhering to the brand’s unwavering commitment to precision and detailed craftsmanship. Made from stainless steel and carbon fibre the flask is durable in style as well as design. The Flask has gone through extraordinarily exacting regimens and processes to ensure the exquisite taste of the single malt when in The Flask is maintained. The Flask, which can hold 20cl, is extremely robust in functionality with every potential circumstance and environment of usage considered. The inner flask is laser welded, wrapped in carbon fibre composite and clad in aerospace grade aluminium. 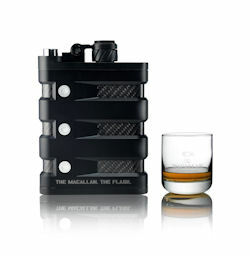 Limited stock of ‘The Flask’ will be available to purchase via www.themacallan.com. 100 flasks will be available from 27th February date, priced £600.